On account of the difficultly soluble paraffins which it contains, oil of rose yields turbid solutions only, even with very large amounts of 90 p.c. alcohol; from these solutions the stear-optene separates gradually. The liquid portion, the so-called eleoptene, yields a clear solution even with 70 p.c. alcohol. When examined by Schimmel & Co., two oils, presumably distilled from white roses, revealed the following properties: 1. (from Karlovo) d30o0,8696; aD - 2°35'; nD25o1,46218; congealing point + 18°. 2. (from Kazanlik) d30o0,8526; aD - 3°50'; nD25o1,45871; congealing point +19°; A.V. 2,2; E.V. 9,9; E.V. after acetylation 213,9 = 70,1 p.c. alcohol C10H18O. Similar constants were revealed by a third oil'2): d15o0,8723; aD - 2°54'; E. V. 11,14; E. V. after acetylation 222,44 corresponding to 73,4 p.c. alcohols of the formula C10H18O. It was soluble in 1 vol. of 90 p. c. alcohol with abundant separation of paraffin. It congealed at 14° but liquefied again completely at 20°3). In connection with an Anatolian oil distilled from red and white Bulgarian roses, Schimmel & Co. ascertained the following constants: d30o 0,8589; aD - 2°20'; nD25o 1,46486; congealing point +19,5°; A. V. 1,4; E. V. 9,8; total geraniol content 74 p. c.
1) As to the index of refracion of otto of roses see also E. J. Parry, Chemist and Druggist 63 (1903), 246. - W. H. Simmons, ibidem 68 (1906), 20. 2) Berichte von Roure-Bertrand Fils October 1908, 28. 3) Hence the stearoptene content of these three oils does not appear to be unusually high, whereas otherwise the oil of white roses is regarded as rich in stearoptene. Comp. p. 552. Fig. 52. 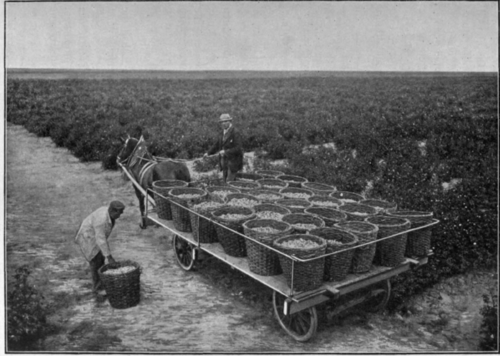 Rose harvest in Miltitz. On account of its larger stearoptene content, the German oil of rose (from Rosa damascena, Mill. ), at ordinary temperature, is a soft, greenish mass permeated by crystals. A complete analysis of three samples is recorded in the accompanying table. Its odor is much stronger and more intense than that of the Bulgarian oil. The congealing point lies between 21 and 37°; the specific gravity between 0,833 and 0,850 at 30°; aD +1 to - 1°. The stearoptene content fluctuates between 26 and 40 p.c. The phenylethyl alcohol content of the last oil enumerated in the preceeding table (determined by shaking out with 1 p.c. sodium hydroxide solution3)) amounted to about 9 p.c. The properties of the oil deprived of phenylethyl alcohol and stearoptene were: d1500,8885; aD - 0°44'; nD20o1,46565; E.V. after acetylation 266,9 = 91,8 p.c. C10H18O; soluble in 1 vol. and more of 70 p.c. alcohol. An oil distilled at Leipzig from Rosa centifolia, L. had the following properties: d25o0,8727; aD +0°49'; congealing point + 28°; S.V. 7,8. According to J. Dupont and J. Guerlain4) two French oils distilled in 1895 and 1896 respectively had the following properties: d30o0,8225 and 0,8407; aD30o - 6° 45' and - 8° 3'; stearoptene content 35 and 26 p.c. respectively. 1) Report of Schimmel & Co. April 1901, 48. 2) Ibidem October 1906, 67. 3) Comp. footnote 3 on page 569. 4) Compt. rend. 121 (1896), 700. P. Jeancard and C. Satie1) have examined the French oils obtained by various methods. 1. The oil obtained from the complete roses (inclusive of the calyx) including the oil separated upon the cohobation of the aqueous distillate. Congealing point 25,5°; stearoptene content 33,2 p. c.2). Properties of the liquid portion (eleoptene): d15o0,8790; aD - 3°; soluble in 2 vol. of 70 p.c. alcohol; total alcohol content 88,55 p. a, citronellol 22,4 p.c. 2. The oil obtained by distilling 1 kg. of roses so as to obtain 1 kg. of rose water. This does not include the oil contained in the rose water (without cohobation). Congealing point + 25,9°; stearoptene content 58,88 p.c; A.V. 2,24; E.V. 14,7°; total alcohol content 32 p.c; citronellol 15,10 p.c. 3. An oil obtained from the calyces, antheridia and pistils but without the floral leaves. The yield from 1000 kg. was about 50 g. d15o 0,8704; aD - 41°; congealing point +8°; stearoptene content 51,13 p.c. ; A.V. 6,12; E.V. 22,4; total geraniol content 13,99 p.c; citronellol 13,56 p.c The high stearoptene content is noteworthy, also the fact that aside from citronellol other alcohols appear to be conspicous by their absence. 4. An oil distilled from tea roses. Congealing point 23,5°; stearoptene content 72 to 74 p.c. Remarkable are the enormously high stearoptene content and the low congealing point. The stearoptene could be separated into a portion melting at 14° and into another portion melting at 40°. The stearoptene from the calyces of the ordinary rose (see No. 3 above) appears to be of similar composition. 1) Bull. Soc. chim. III. 31 (1904), 934. 2) It is to be noted that the stearoptene content was not determined in any of these oils as described on p. 573. J. and S. proceeded according to the following method: 10 g. of oil are weighed in a beaker when 50 cc. of acetone, chilled to - 10°, are added without shaking. The mixture is then filtered through a filter surrounded by a freezing mixture, the residue washed several times and the liquid removed with the aid of a suction pump. The tared filter is dried in a vacuum desiccator over sulphuric acid and weighed. Upon the analysis of a Russian oil (from Kachetia, comp. p. 553), Roure-Bertrand Fils1) obtained the following constants: d30o0,8368; aD26o - 4° 16'; congealing point +23°; stearoptene content 33,5 p. c; A. V. 5,7; E.V. 4,7; total geraniol 48,9 p. c; citronellol 34 p.c.